The Integrated Stepper Motor is a very economical motion control system because of its built-in microstep controller and driver electronics that are integrated into the assembly. The Integrated Stepper Motor series takes the guesswork out of stepper motor and driver compatibility. The 17MDSI and 23MDSI series is excellent for simple motion applications. The bipolar microstep driver features resolutions from 200-1600 steps/revolution, and features over-temperature and short-circuit shutdown provisions. Integrated Stepper Motors, drivers and controllers are available in NEMA sizes 17 and 23, with torque ratings from 31 to 425 ounce inches. High torque stepper motors are used in the Integrated Stepper Motor series offer 1.8 degree step angle with stack lengths of 1/2, 1, 2, or 3, providing for a wide range of start-up torque and intertia. If you need modifications done on your stepper motor windings, shaft modifications and encoder adders are available for remote monitoring of position. Integrated Stepper Motors include built-in microstep driver electronics, eliminating the need for motor wiring and hookup. The 17MDSI series also contains a simple indexer/controller with RS485 communications. It is available in three stack lengths, delivering from 30 to 62 ounce inches of torque. The bipolar microstep driver features resolutions from 200-1600 steps/revolution, providing smooth rotary operation. Integrated Stepper Motors include built-in microstep driver electronics, eliminating the need for motor wiring and hookup. The 23MDSI series also contains a simple indexer/controller with RS485 communications. It is available in four stack lengths, delivering from 76 to 425 ounce inches of torque. The bipolar microstep driver features resolutions from 200-1600 steps/revolution, providing smooth rotary operation. 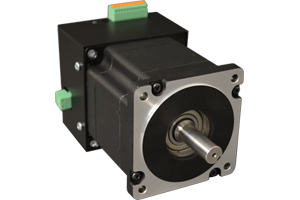 The 23MDSI Integrated Stepper Motor is available in either a single-shaft version or a double-shaft version with optional encoder. Integrated Stepper Motors include built-in microstep driver electronics, eliminating the need for motor wiring and hookup. The 34MDSI series also contains a simple indexer/controller with RS485 communications. It is available in 3 stack lengths, delivering from 637 to 1700 ounce inches of torque. The bipolar microstep driver features resolution of 2000 steps/revolution, providing smooth rotary operation. The 34MDSI Integrated Stepper Motor is available in either a single-shaft version or a double-shaft version with optional encoder.